From 1999-2000 and again in 2003 and 2009 I conducted field work on the slopes of Mount Banahaw among religious movements venerating the Filipino national hero José Rizal as the Filipino Christ, and healers who regard the mountain as a site of spiritual power that sustains their power to heal. The mountain also attracts a regular stream of pilgrims and tourists keen to visit ‘Kalbaryo’ (Calvary) and the caves, waterfalls and tunnels – all shrines (mga puwesto) of varying size and complexity, including ‘Santong Jacob’, ‘Prisentahan’ and ‘Husgado’ (cave shrines), waterfall shrines such as ‘Kristalina’ and ‘Suplina’ and river shrines such as ‘Tubig Kinabuhayan’ wherein one can see the yapak ni Kristo (‘Christ’s footprint’). Pilgrims typically light a candle or leave an offering such as a crucifix crafted from materials close at hand or insert a small piece of paper inscribed with a prayer in a crack in the rock. This kind of behaviour can certainly be understood religiously and psychologically in terms of specific motives or intentions to fulfil a vow or make a penance or some such. 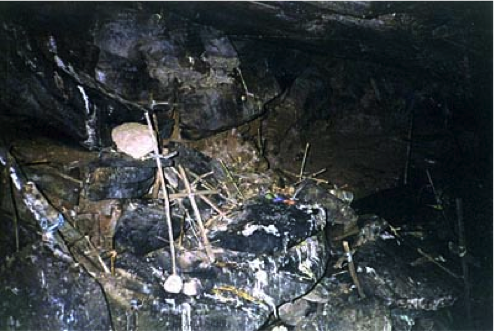 However, the shrines are not simply sites for individuals to travel to and make an offering – the shrines are themselves complex assemblages that indicate a collision of knowledges and cultures, expectations and hopes. 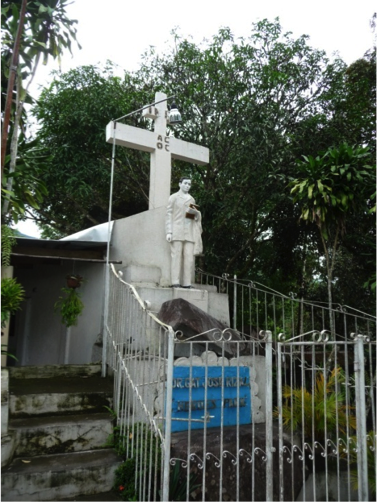 The implication of Banahaw in the veneration of José Rizal points to the colonial history of the area as a site of resistance to Spanish rule and the inflection of that resistance in Filipino and Tagálog nationalism and ideologies of sacrifice (Rizal was executed by Spain), empathy (Rizal’s death and the grief it precipitated is central to the social memory of the peoples of the region) and notions of spiritual power and potency (revolutionaries carried special amulets or antíng-antíng to protect them from the bullets of colonial troops). Mount Banahaw has a reputation, among Filipinos, as a place where such amulets are particularly efficacious. Shrines to Rizal are to be found all over the village Sta. Lucia on the lower slopes of the mountain, while other shrines include items such as the national flag – further evidence of a collision of Catholicism, nationalism and anti-colonial resistance mediated through a complex local history of indebtedness to powerful landlords and influxes of migrants from other Tagálog-speaking areas. However, the shrine-assemblages of Mount Banahaw point not only to the archipelago’s political history but also to its religious history. Pilgrimage to Mount Banahaw occurs very much at the margins of official Catholicism, pointing to an entangled array of practices and epistemologies that invite designations including shamanism and animism that combine to de-centre any sense of a unitary Christianity. 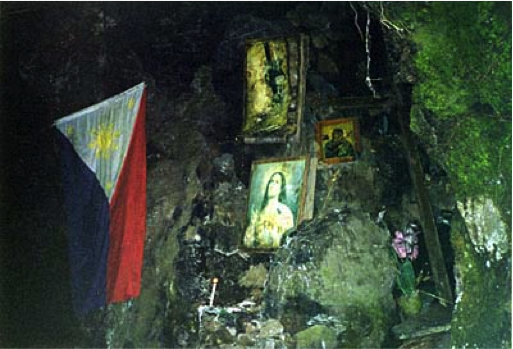 The bricolage and vernacular material religiosities displayed in Mount Banahaw’s shrines also indicate a certain kind of local hermeneutic for interpreting the Bible: the interpolation of Rizal into Biblical narratives and the transposition of Biblical places and events to Mount Banahaw suggests a reading back and forth from local experience to the posited universal of the Bible that produces a new hybrid text in the process. In short, offerings constitute evidence not merely for individual religiosity but, as complex assemblages of objects, provide evidence for and insight into local Filipino culture as well as a point of departure for thinking more generally about interpreting material culture. October 1, 2014 in Fieldwork, Ideas.